The system that reveals the psychology behind the most effective leaders in the world, Integral+Leadership ™, reveals how to lead, engage and motivate your people in the way they drive (self-actualise) themselves. In Integral+Leadership ™, this is Leading. This article is about visioning and creating an organisational (leadership) vision that is engaging, moving, intentional, purposeful, and time-based. The word vision (a nominalisation) comes from the verb envisage: to create a mental picture of something in the future, especially in advance of realisation. So, a vision is merely a future construct that leads us to take action, to enable us to achieve our untapped potential. To challenge the status quo and stretch us beyond our comfort zone. An integral vision ensures that we are utilising all available perspectives and therefore resources for the situation, leading to a higher likelihood of success and fulfilment. For a vision to be both engaging and effective, it must mismatch the status quo. The process of visioning starts with identifying the organisation's most significant issue, that is holding it back from achieving its full potential. Once you can identify, clarify and articulate this, and that is often harder than most people think, then you can create a vision to mismatch and resolve that issue. Your people can then get on board with it, because it's moving away from what they see as holding them back, as holding their potential back, as keeping the organisation's potential back. That could be clarity, that could be poor leadership or management, that could be changing markets, that could be organisational structure, that could be the current direction that the CEO and leadership decided that isn’t working, it could be many things. Without identifying what is the most significant issue is, how can you possibly create a vision that speaks to what is going on now while simultaneously pointing to Utopia? In our experience, the main problem with most organisational visions is that they are long, laborious statements of functionality, they tend to have an operational, and outcomes-based focus. They also can be wholly uninspiring, and they are, sometimes, actively disengaging, in that they hold no meaning for people up, down and across the different levels of an organisation. 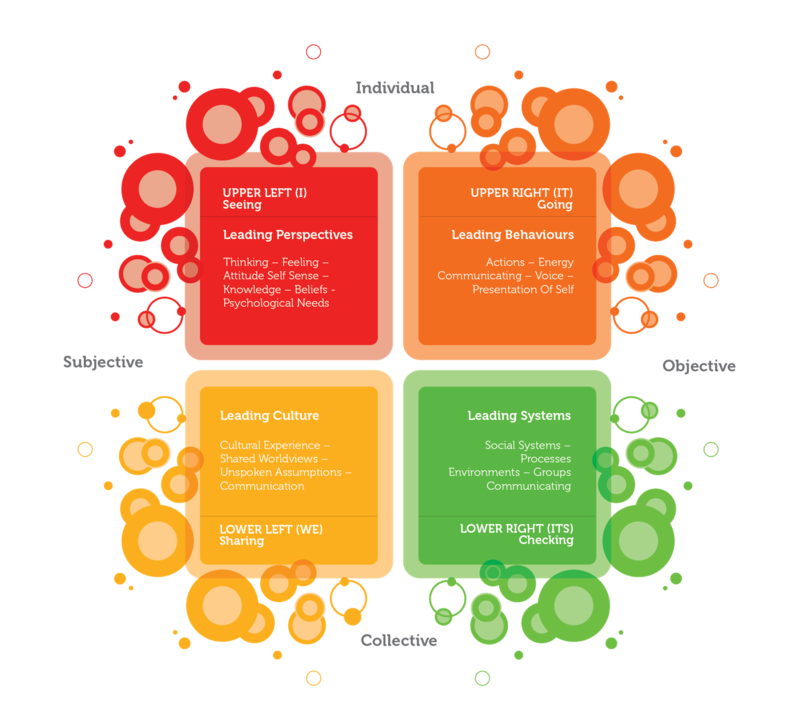 In our Integral+Leadership ™, approach to visioning, we use Ken Wilber's Integral Quadrants; that is first, second, third- and fourth-person perspectives. Take a look at the map below and the description of each of those perspectives, and then we'll look at how we use each of those perspectives to further flesh out the problem and therefore, create new views that mismatch the problem in each of those four perspectives. Let’s take a quick look the quadrants and the perspectives they represent. We’ll also look at how you can facilitate wisdom through the process. 1st Position (first-person perspective) – Self (I) - The position of seeing, hearing, and feeling from out of oneself. First Person. This is an individual’s subjective truth. This position is also known as “seeing”. Subjectivity. Pronouns; I, me, my. The study of this perspective is the study of epistemology. 2nd Position (2nd person perspective) – Other (we) - The we (empathy) position of understanding, feeling with and seeing things from another’s point of view. This position is known as “looking as another”. Inter-subjectivity. Pronouns; We, us. The study this perspective is the study of enculturation. 3rd Position (third-person perspective) Meta (it) - The position of stepping back to gain a sense of distance, to observe, to witness, to be neutral, and appreciate other perspectives (see what they cannot see). This position is known as “looking at another or thing” Objectivity. Pronouns; It, that, there. The study this perspective is the study of science. 4th Position (fourth person perspective) Meta System (its) - The position for understanding the broader context(s) (i.e. environmental, social, linguistic, business, family, organisational and other systemic contexts.) that influence all of the larger systems and settings of our world. This position is known as “looking systemically”. Inter-objectivity. Pronouns; Its. The study this perspective is the study of social science and systems theory. If the vision needs to mismatch the status quo, then we can use the quadrants to identify that parts involved. First person is the new attitude of the individual within the organisation, required to outframe and resolve the issue. Second person is the different culture of the collective within the organisation, required to outframe and resolve the issue. Third person is the new behaviour of the individual within the organisation, required to outframe and resolve the issue. Fourth person is the different environment, social interaction, system or process of the collective within the organisation, required to outframe and resolve the issue. - Being trapped in a systemic struggle (where something no longer functionally fit within a system). When we run these workshops, we ask that the team come up with either a sentence or a single word for each of these quadrants (perspectives), then here's the significant bit, the final vision comes from bringing all 4-perspectives together in an engaging, connective, relative, purposeful and intentional way.